With the full name of Camellia japonica ‘Dona Herzilia De Freitas Magalhaes’ this old fashioned plant has a few idiosycracies. 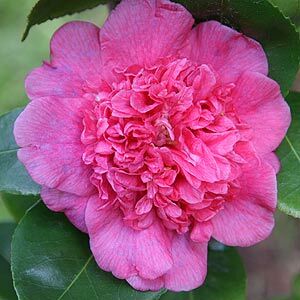 Camellia ‘Dona Herzilia’ as it is commonly named, is said to change flower colour depending on soil ph. Acidic soils are said to result in a purple to mauve flower, more alkaline will have a pink flower. However we tend to disagree with this theory, as on our plants flowers seem to open pink and then turn to the purple colour as they age. We think that the coldness of the winter also has an influence on flower colour, the colder it is the more purple the flowers will get. So above right we have pictured a one week old flower, and below one at around 2 weeks. Another common theory is that it is difficult to grow, we have never found it so, and have seen it growing in many gardens as well as our own. It can be tricky to find, however it is available in Australia from a number of growers. Best grown in a sheltered position to protect the flowers from wind and rain, we have grown ‘Dona Herzilia’ for a number of years. It seems to produce masses of flowers consistently. We suggest pruning after flowering to maintain a bushy habit. Well suited to slightly acidic soils and good solution for a south facing position. Camellia ‘Dona Herzilia’ can be lightly pruned after floweringto maintain a bushy shape. A few mispellings around this name. 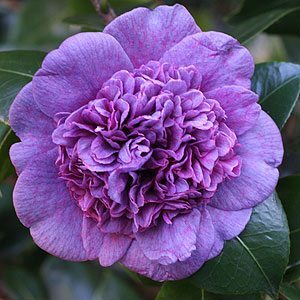 Also seen as Camellia Dona Herzillia and Donna Herzilla.